The National Environment Agency and The Nature Society (Singapore), with the support of National Geographic Channel, have organized a mini-documentary/film making contest titled Through Green Lenses: A Semakau Mini-documentary/Film Making Contest 2012. The contest aims to promote awareness of the rich biodiversity on Semakau (Singapore’s unique offshore landfill), and gives budding documentary and film makers the rare chance to capture Semakau’s natural beauty and win great prizes! Winners will also get to meet National Geographic Explorer Zeb Hogan, host of highly-rated documentary ‘Monster Fish’. Through Green Lenses is a mini-documentary/ film making contest where you have the chance to capture and showcase the unique co-existence of waste management and rich biodiversity on Semakau. Semakau is a unique offshore landfill located south of the main island of Singapore, and also co-functions as a recreational destination for nature lovers. It boasts of scenic landscaping and vibrant biodiversity, making it the perfect stage for you to show your appreciation of nature and exhibit your documentary/ film making talents. 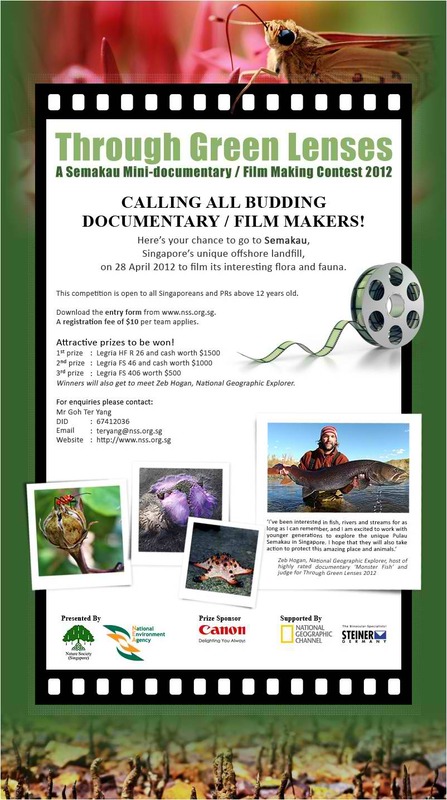 Here’s your chance to go to Semakau to film its interesting flora and fauna and win attractive prizes. – You will have to provide your own video cameras. – Lunch and afternoon tea will be provided. – You will be loaned binoculars to enhance your nature viewing experience. To register, download Entry Form. – This competition is open to all Singaporeans and PRs above 12 years old. – Participants can register either individually or in pairs. – A registration fee of $10 per team applies. – Registration is restricted to the first 45 teams that submit their Entry Forms and full registration fees to us. – For enquiries, please email teryang@nss.org.sg. This entry was posted in Brand: Canon, Brand: Others (Cosina, Carl Zeiss, Leica, Mamiya, Samyang, Vivitar, Zenitar,etc), Photography Contests and tagged Canon, National Environmental Ageny, National Geographic, Nature Society of Singapore, Steiner. Bookmark the permalink.